In this blog's world, The Great British Band Of The Sixties isn't those loveable mop-tops from Liverpool (good as they were), but of course, the Bonzo Dog Band. Tho comparing them to the Beatles isn't quite accurate, as the Beatles were pretty much a straight-ahead (if wildly creative) rock band, and the Bonzos were a Dada/ jazz/ comedy/ psychedelic / performance-art / avant-'tarde / rock band. 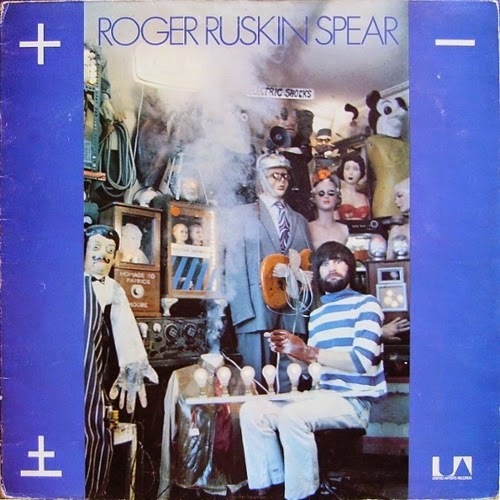 And Roger Ruskin Spear - he of home-made robots, fanciful stage props, explosions, and performing on a theremin hidden in a mannequin's leg - carried on the band's traditions perhaps more faithfully than his two more celebrated band mates Viv Stanshall and Neil Innes, both of whom went off into some rather non-Bonzo-like (tho frequently rewarding) directions. 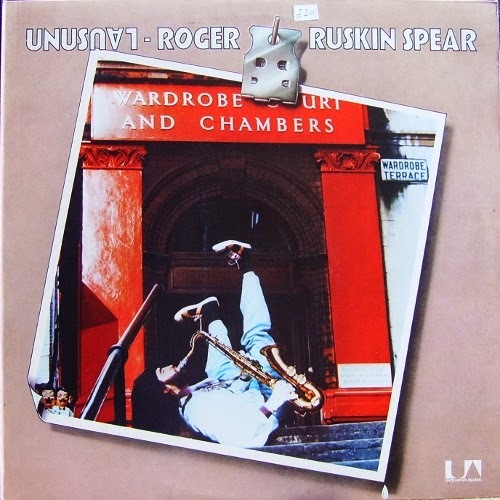 Spears' two solo albums in the early '70s following the band's dissolution sticks with the original Bonzo plan of playing crazed "trad" jazz, rock parodies, covers of forgotten old novelty records, and wildly inventive original creations, all drenched in good-humored absurdity. When I first came across a copy of "Electric Shocks" in a thrift store in the '90s, I'd had no idea that Spears had made any solo albums. I certainly wasn't expecting it to be as good as it was. Originally it's follow-up album "Unusual" was posted here as well, but something, er, unusual happened to the files, so we're only posting "Electric Shocks." Hopefully I'll get a good uncorrupted copy of "Unusual" cuz it's a goodie. But to make it up to you, three bonus tracks have been added. Roger Ruskin Spear "Electric Shocks"
"Dolphins" - a group of French Algerian port city of Oran (Oran). Created brothers Gerard and Robert Shatelenami together with Alain Martin, Andre Castro and Gilbert Hullo. Existed in the years 1964-1966, longpleya not released, was 4 EP's, released via Columbia ... Almost all of the band's work has been collected in 1993 on this compilation. Vocals - exclusively in French." Thank you, Google Translate! It's another curio from the days when non-Anglo-American cultures were grappling with the rock 'n' roll behemoth that had just washed up on their shores, and were struggling to find a way to integrate it into their culture. At least these guys didn't try to sing in English. But French just isn't a rock 'n' roll language, even when sung Elvis-style. Tho on one of the best songs here, the Isley Brothers-esque "Ne Pars Pas," they do sing the word 'baby' a lot. It's all a lot of twistin', rockin' fun, with some recognizable covers strewn amidst the originals, e.g. : "Whole Lotta Shakin' Goin' On," and the Gene Pitney/Ricky Nelson hit "Hello Mary Lou." "Le Voyageur" is Nelson's "Travelin Man." Highlights include the early-Beatles-ish "L'Amour Nous Dira Oui," the wtf? harpsichord solo on "Celle Qu'il Me Fallait," "Non, Ne Me Dis Pas" (fuzz garage rocker) and, my fave, "Serrons-Nous La Main." A big merci to Count Otto Black! 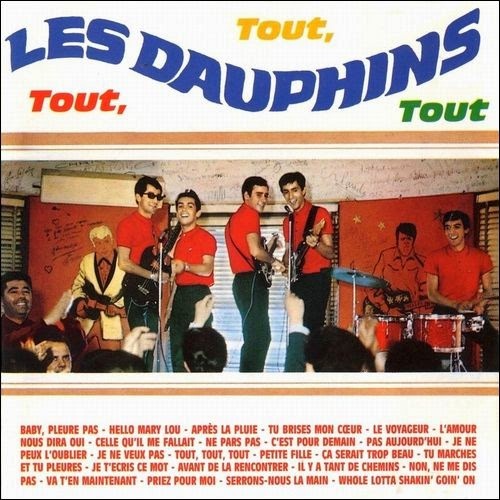 Les Dauphins "Tout, Tout, Tout"